Ingersoll-Rand multi-vane air motors have been selected because of their dependability, low maintenance and excellent design. 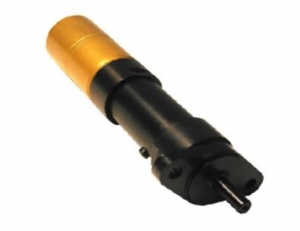 The motors are compact, lightweight with a high power output. Other features include cool running characteristics that minimize the effects of hot, wet or dusty conditions. Instant starting and stopping eliminates the delays of motor acceleration or deceleration periods, preventing electrostatic sparks and producing safe operation in hazardous conditions. It will not overheat or burn out even when overloaded or run to stall. No hydrocarbon release makes the HoverTrowel ideal for food, beverage and other sensitive industrial areas. HoverTrowel’s standard motor for common epoxy systems is the HT-167. 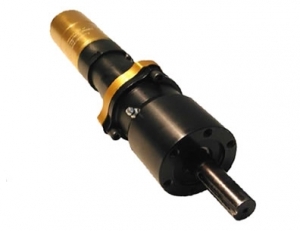 The higher torque HT-188 is recommended for very resin rich or sticky systems. Other motors are available for some flooring systems with unique physical properties and characteristics. The motors produce a range of rpm and torque loads to suit the needs of most of the polymer toppings on the market today. The HT-167 is used for most standard hand and power trowel systems. The HT-188 is used for very resin rich systems, as well as the cementatious toppings on the market. This motor will perform well on all systems, making it extremely versatile. Use the performance curves shown to the left for the HoverTrowel’s air motor characteristics. Click the chart to see an enlarged version. Performance data may vary slightly depending on gear ratios; when this occurs, median performance is indicated. Follow the following guidelines for interpreting the performance curves. Locate operating speed on the correct horizontal axis of the bottom chart. Read Horsepower from the correct curve in the bottom chart. 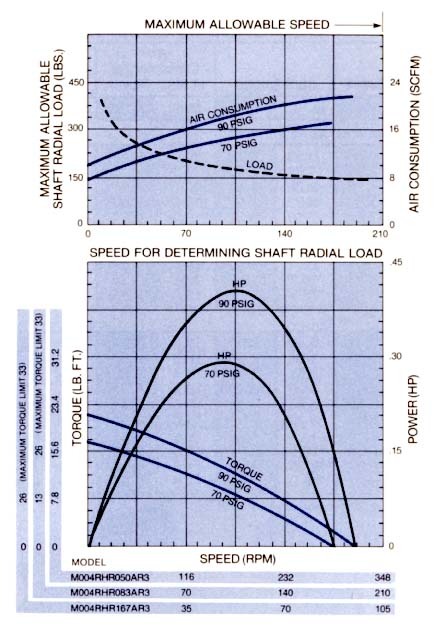 Read Torque from the correct curve in the bottom chart. Locate operating speed on the correct horizontal axis on the bottom chart. Read Air Consumption from the correct curve in the top chart. Reducing or restricting the amount of air supplied to the motor has a similar effect to reducing the air pressure. Choking or restricting the exhaust has a somewhat different effect, with the speed decreasing much more than the torque. The effects of changes in pressure, air supply and exhaust regulation are summarized below. Exact variations in performance with “choked” motors are not tabulated; however, “on the job” tests will usually produce the desired results; sometimes from a combination of pressure adjustments and inlet and exhaust restrictions.